Friday night: Cloudy with a few snow showers. A coating is possible in spots. Near 32. Saturday: Milder! Mostly cloudy. Chance PM shower. Near 50. Sunday: Steady rain. Heaviest south. Upper 40s. A warm front is crossing New England from southwest to northeast tonight. Along and just north of the front we have an area of light to moderate snow from western Massachusetts through much of Vermont, New Hampshire, and western Maine. 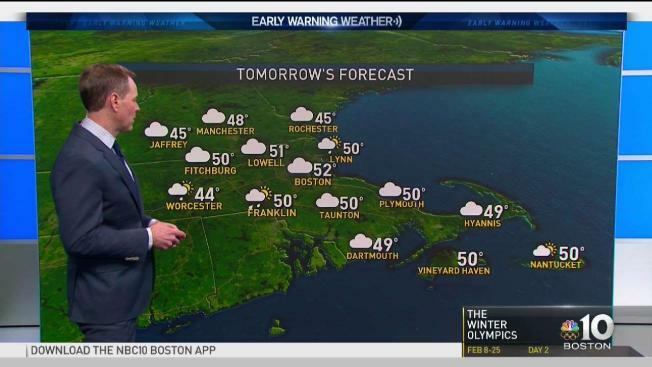 For most of Connecticut, Rhode Island, and eastern Massachusetts we are just mostly cloudy overnight. However, once north of the Merrimack Valley and RT. 2 in Massachusetts travel conditions are in pretty rough shape overnight and into much of the weekend. The front line is expected to move northward to Rutland Vermont to Lewiston Maine, with snow continuing north of that line for most of Saturday and Sunday. Meanwhile, in southern New England there are a few sunny breaks with not such a bad Saturday, however rain becomes heavy with possible flooding on Sunday. Our weekend temperatures are climbing through the 40s in to the lower 50s south, and holding in the 20s 30s to near 40° north. The wind direction is all important, it may be from the north for most of Maine, and from the south for most of western and southern New England. It does not look too strong, but gusts from the southwest make it to 20 to 30 mph for southernmost New England. Also, along and north of the front we have a very low sky, that means not only is it snowing and raining, possible freezing rain, we are also going to have patchy dense fog, especially late Saturday and most of Sunday. Most of us get back onto the cooler side of the front on Monday with drier weather, however puddles may re-freeze in spots Sunday night into early Monday. The weather looks fairly quiet and seasonable for Monday with temperatures in the 30s and 40s, then a weak wave of low pressure may bring a little bit of rain or snow on Tuesday. The story is getting a little bit old, but it's a very challenging forecast, with Canada full of cold, warmer air with a lot of moisture to the south of New England, we are right on that boundary with a very active changeable weather pattern right through next week. Right now, there's no significant storm we can look at past Sunday, but there may be something bigger trying to come in later in the week. At that point, we could be warmer or we could be cold. Too early to tell.